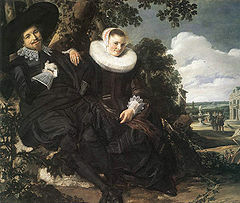 Frans Hals, Married Couple in a Garden, 1622. Flower Still Life with a Watch by Willem van Aelst, 1665. The Dutch Century or the Dutch Golden Age is a period in Dutch history in which the Dutch Republic had a phenomenal rise to prosperity. It was over the course of the 17th century that great advancements in the economy, military, trade, arts and sciences took place. Jan Vermeer, Girl with a pearl earring, 1665. Dutch painting of the Golden Age comes in the period of Baroque painting. However, it lacks the idealization and love to splendor, typical in much Baroque artists, reflecting a realism inherited from Early Netherlandish painting. In this period, a proliferation of distinct genres of paintings is conducted. With a small amount of religious painting, other genres like scenes of peasant life, landscapes, townscapes and cityscapes, seascapes, and still lifes of various types, specially flower paintings, all were enormously popular. Seventeenth-century Netherlanders had a passion for depictions of city and countryside, either real or imaginary. Local scenery asserted Holland’s national pride, while vistas of foreign sites recalled the extent of its overseas commerce. Holland’s ocean ports teemed with fishing and trading ships, and the tiny country’s merchant fleet was almost as large as all the rest of maritime Europe’s combined. Maritime painting was enormously popular in Dutch Golden Age. Amsterdam was the largest artistic center. Esaias van de Velde, A Winter Landscape, 1623. Hendrik Cornelisz Vroom (Haarlem, ca. 1562/1563 – Haarlem, 1640) was a painter credited with being the founder of Dutch marine art or seascape painting. Ambrosius Bosschaert (1573–1621), a flower painter who founded a dynasty. He was one of the early Still life painters of the Dutch Republic. Frans Hals (ca. 1582–1666) painter born in the Southern Netherlands (present-day Belgium) was principally a portraitist, but also painted genre. Esaias van de Velde (1587–1630) who was a landscape painter. Balthasar van der Ast (Middelburg, 1593 ó 1594 - Delft, 1657) pioneered still lifes of shells, as well as painting flowers. Gerrit van Honthorst, The Matchmaker, 1625. Balthasar van der Ast, Still Life with Fruit and Flowers, 1620-1621. Willem Claeszoon Heda (1593/1594 – ca. 1680/1682) was an artist devoted exclusively to the painting of still lifes. He is known for his innovation of the late breakfast genre of Still life. Willem Claeszoon Heda and Willem Kalf led the change to the pronkstilleven in the mid 17th century. Salomon van Ruysdael (1602–1670), a landscape, river scenes and fish still life painter. He was one of the pioneers of the landscape genre. Philips Wouwerman (1619–1668) added men and horses to turn a landscape into a hunting scene. Willem Kalf (1619–1693) who specialized in still lifes. Later in his life, Kalf became an art dealer. Abraham van Beijeren (ca. 1620–1690) chosed birds, as well as dead fish for his paitings. Jacob Isaacksz van Ruisdael (ca. 1629–1682), a prolific and innovative landscape painter. He is regarded as the greatest of all Dutch landscape painters; van Ruisdael excelled in the painting of cloudscapes. Johannes Vermeer (1632–1675) who worked in domestic interior scenes, producing paintngs like "Girl with a Pearl Earring", (1665), "The Milkmaid" (c. 1658) and "The Girl with the Wine Glass", ca. 1659. Adriaen van de Velde (1636 — 1672) painter, draftsman, and etcher, who specialized in landscapes and animals; he also added people or farm animals. Kalf selected objects of high aesthetic appeal centered around a large bulbous porcelain pot with blue and white glaze. This also appears in other works on Kalf (in the Louvre, Paris, the Museum Prinsenhof, Delft, the Musée de Picardie in Amiens and the Museum of Art, Indianapolis). Still life painting flourished during the Golden Age of the Dutch Republic. Willem Kalf, Still Life with an Aquamanile Fruit and a Nautilus Cup, ca. 1660. Banquet, Banketje or small banquet, were "banquet pieces"; they were very similar to breakfast pieces but, the food items were what were typical in wealthy home. The vanitas theme where still lifes that had a moralistic message, usually concerning the brevity of life. Vanitas still lifes were a specialty of Leiden artists such as Jan Davidsz de Heem and David Bailly. Pieter Claesz was influenced by this artistic movement. One of Willem Claeszoon Heda's earliest work was a Vanitas. From the mid-century the pronkstilleven ("ostentatious still-life"), showing expensive and exotic objects, became more popular. This was the favorite theme of Willem Kalf who is regarded as the “father” of this style. Adopted by Peter Van Beyeren, Pieter the Ring, Janz Davidz de Heem, Floris Claesz van Dijck and later painters who choose sumptuous objects and very vivid colors. Flower paintings formed a sub-group with its own specialists, occasionally the speciality of the few women artists, such as Maria van Oosterwyck and Rachel Ruysch. The success of 17th century Dutch painting influenced the work of subsequent generations. They settled the tradition of Still life painting. Jan Vermeer, View of Delft, 1660-1661. Willem Kalf, Landscape with a man unloading produce from a donkey, seen through an arch. Willem Kalf, Still life with a sugar bowl of Ming porcelain, a nautilus goblet, a golden goblet, a champagne glass, and a wine glass on an oriental rug. Rembrandt, Christ In The Storm On The Sea Of Galilee, 1633. Jan Davidsz de Heem, A Table Of Desserts, 1640. Adriaen van Ostade, Resting Travellers, 1671. Salomon van Ruisdael, View of Deventer Seen from the North-West, 1657. Rembrandt van Rijn. Britannica Online Library Edition. Significant Collections of 17th-century Dutch Painting in the World.